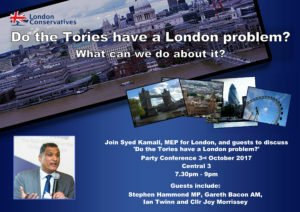 3rd October – Do the Tories have a London problem? There are no two ways of looking at it, the Conservative Party is not doing well in London. We have a Labour Mayor and we didn’t do well enough in the General Election either. Yet despite all this, a large number of people in London continue to vote for a party which isn’t giving them what they thought they were promised (see the GLA Conservatives report here). Is it that we don’t have the right policies for London or is it that we do have the right policies but we aren’t communicating them well? If it is a question of image, then how can we communicate what we offer Londoners in a way that gets people to see beyond the colour of our rosettes? What can we learn from the recent election? What did we do wrong or right? I will be discussing these important questions and more at the Conservative Party Conference on 3rd October in “Central 3” at 7.30pm along with Stephen Hammond MP (MP for Wimbledon), Gareth Bacon AM (London Assembly), Ian Twinn and Cllr Joy Morrisey. If you care about winning back London, have ideas to share on how we can do better or issues you would like to discuss then this will be the event at the Conservative Party Conference to do just that. Reserve your place now at the link on this screen. If recent elections have shown us one thing, it is that nothing is certain in politics anymore. Let’s get Conservatives winning in London again.